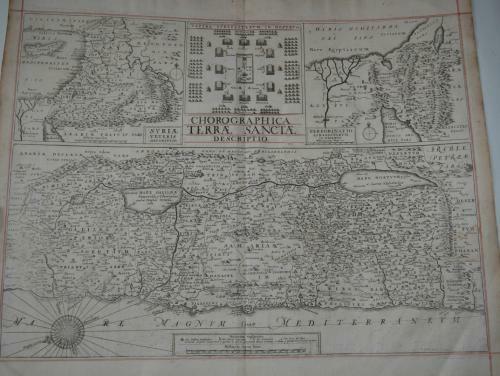 A rare map of the Holy Land by Wencelaus Hollar (1607-1677), an engraver, born in Prague, best known for his city views.. This sheet includes three maps of the Holy Land and a plan of the encampment of the Israelites in the desert. The large map at the bottom of the sheet depicts Palestine on both sides of the Jordan, divided into the 12 Tribes. At top left is the Holy Land along with part of the eastern Mediterranean, extending to include Cyprus. The map at top right focuses on the area between the Nile Delta and the Dead Sea, illustrating the Exodus. The three maps are based on similar ones by Philippe Briet. In good condition, minor margin toning and a few small chips. Would frame well.